Failed a course? Want to lighten your workload during the school year? Hoping to finish your degree in under four years without overworking yourself? Ryerson’s Chang School of Continuing Education has you covered. Offered in a variety of formats (depending on the course), students have the option to complete degree credits in either the Spring or Summer semester. These formats include: classroom, distance education, and week-long intensives. Your advisement report will tell you which courses you have left to complete in order to graduate. You can check this on RAMSS, under “My Academics.” Your advisement report can be confusing, so look to your Academic Advisor to help you to clarify what it all means. Not sure who your academic advisor is? Click here to learn more about Academic Advisors. When you click on “Spring/Summer 2015,” you will be presented with a list of all the courses offered in either semester (in some cases, both). If the course you want to take is on this list, you can click on it to get information on formats offered (e.g. classroom, distance education or both), class time and dates, antirequisites, course duration as well as the cost of the course. Log onto my.ryerson and go to RAMSS. Under the academics tab, you will see “search” (click on this). Here, you will be prompted to enter the term (Spring/Summer 2015), subject and course code. When enrolling in a Chang School course, be sure to enter the course code with a C in front of it (e.g. PSY 102 will be CPSY 102). Select the course you would like to take and follow the on-screen prompts to finish enrolling. You can enrol in person at Enrollment Services & Student Records (located at POD 74). They will have you fill out a form with the program information, so be sure to have this handy! As an undergraduate student, fees for any Chang School Spring/Summer course that you enrol in will appear on your RAMSS account. As you do with normal undergraduate courses, you have the option to pay for these with online banking. You can pay by credit, debit, cheque and money order. Cash is not accepted. Although undergraduate students are not normally permitted to pay for courses with a credit card, all Chang School courses (regardless as to whether you are an undergraduate student or a Chang School student) can be paid for with a credit card. Chang School students must pay for courses immediately. Ryerson Undergraduate students must pay by the end of the calendar month. Payments can be made at the Enrollment Services & Student Records office (located at POD 74). Q: What if I need to drop a Spring/Summer course that I enrolled in? Q: When do the Spring/Summer terms begin/end? A: Spring courses typically start the week of May 4, 2015. Monday/Wednesday classes end June 17, 2015 and Tuesday/Thursday classes end June 16, 2015. 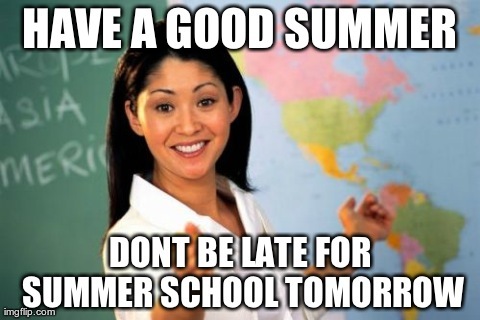 Mid-Spring/Summer courses typically start the week of June 22, 2015. Monday/Wednesday classes end August 10, 2015, and Tuesday/Thursday classes end August 4, 2015. See more dates and deadlines, here. Q: Is there a limit of on how many courses I can take? A: As long as the courses you enrol in do not impose any time conflicts with one another, there is no limit on how many courses you take. Before signing up for multiple courses, be sure to take into account your own ability to balance the workload that goes with Chang School courses. Course work can be heavy and if you’ve also landed a full-time summer job and intend to maintain some form of social life, maybe taking two or more courses at once isn’t for you. If you are doing a non-intensive Chang School course, it is good to remember that the courses will be held for two months whereas Fall/Winter Ryerson courses are four months long. The workload will therefore be notably condensed. Q: Are Chang School courses more expensive? A: Prices vary depending on the course. You can compare course prices by searching for them on the Chang School website. 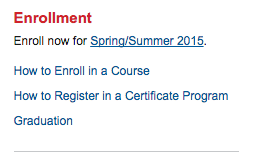 Q: When is the last day to enroll in a Spring/Summer course? A: You can enrol up until classes begin, provided that space is available. 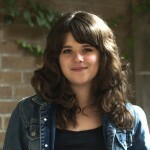 Jessica’s experience: I enrolled in a Summer course during my first year of university. It took place on campus and was held twice a week 6:00pm-9:00pm. I spent most of the month reading two long chapters a week instead of one (as is typical of Fall/Winter semester courses). We were also given weekly quizzes and assignments. Although it was a lot of work, I found that I was able to absorb the information more easily because I spent more than six hours a week immersed in it. Advice: I would recommend taking it in the classroom, but wouldn’t advise anyone to take more than one course per Spring/Summer semester. Because the course was condensed into a little over one month, the workload was heavy, so I wouldn’t recommend missing any class time. Jermaine’s experience: When I enrolled, information on how to log in and participate online was emailed to me before the course began. Every week at a designated time, we had to log into Blackboard to participant in a “chatroom” typed discussion board and answer questions regarding assigned material. This allowed the professor to give participation marks. Because there were no in-class lectures, we were expected to compensate by doing more reading than what is typical in a normal classroom setting. Midterms were written on Blackboard while the final examination was supervised and took place on campus. The classes took place every Saturday. Advice: These courses require a bit more commitment, motivation and consistency than in-class courses do. Make sure to do your distance education work in a productive environment, like at school. Don’t do it in a place where you normally relax, e.g. where you play video games. The lack of classroom setting makes it difficult to engage with the material and creating a working environment will help. Don’t expect the class to be easier just because it’s online. Assignments can be more heavily weighted than you would normally see in the Fall/Winter semester. I had a distance education course where the midterm was worth 40% and the final was worth 60% of my final grade. The courses are sometimes taught by actual Ryerson professors but may also be taught by an external/non-tenured professor. If the latter is the case, email may be the only means of communication between you and your professor since they won’t have an office on campus—so don’t wait until the last minute to contact them. Because you can’t lean on your classmates like you would in a normal classroom setting, you need to get used to being an independent worker. Worst online experience: A group project. My group members were older than me and most had careers and were only available to work on Friday nights. Elvira’s experience: I learned about intensive courses through a friend. I needed to complete a specific credit for my degree and didn’t want to take a full course load (of five courses) during the school year, so I opted for this option. I felt it was a good option to sacrifice my reading week in order to get the course done and over with. I was in the classroom for ten hours a day, five days a week—culminating into thirty-nine hours total. We had a lot of group projects and because we didn’t normally have extra time to do work on them, we had to stay behind after class to work together. Because of this, I was really in the classroom for about eleven hours every day. The grading scheme was similar to regular courses in that your marks came from in-class participation, small assignments and projects. The days were really long and we weren’t moving much. It was literally five days of eating, sleeping and going to class. We were given 40 minutes to an hour for lunch. My final assignment was a paper (worth 35%) that I was given five weeks after the end of the course to complete. It was hard, but I would do it again. I learned a lot in a short amount of time and found the information to be more in-depth and less fragmented. It was easier to consolidate the information. Advice: Pick a course you wouldn’t mind talking about for ten hours a day. Make sure that you are able to book time off to complete this course because your whole life will stop for one week. Your performance in these classes will reflect how you perform in general when it comes to school. Group work is common in these courses and makes up a large portion of your grade. If you are in your final semester, your graduation might be delayed if the final assignment isn’t marked in time. The onus is on you to let your professor know that you’re supposed to graduate, so that your work will be marked in priority. Any more questions regarding Spring/Summer courses? Want to share your own Spring/Summer experience? Feel free to visit us at the AskMeRU InfoDesk in POD-61 or ask us on Twitter.